Traditional cotterless cranksets use a tapered square spindle (axle) end. The sides of the end taper at a 2 degree angle compared to the centerline, 4 degrees compared to each other. The crank has been cross-sectioned in this photo to show how it is attached to the spindle. The dustcap has been removed to reveal the fixing bolt. While there is general agreement about the angle, there is no such agreement about the actual width cut off. There are two standards in current use, and there is another used on some parts still seen. The differences can look subtle, until you actually insert a spindle into a crank. The spindle approaches the bottom of the dustcap hole in this crank. There is a risk of the fixing bolt's bottoming out on the spindle. This crank is at risk of bottoming out on the end of the tapers. This combination is safe from bottoming out. The photos below are of Phil Wood cartridge bottom-bracket spindles, which are the same except for the tapers. Note that the shafts of the spindles, at the left side of the photos, are all the same size. The appearance of the tapers on other spindles may differ. J.I.S. is the Japanese Industrial Standard, and is generally used on square taper cranks made in Asia. All of the common black spindles identified with standard numbering use the J. I. S. taper. Many of these have a threaded boss for a nut on each end, rather than being hollow and threaded internally for a bolt. ISO square taper spindles run longer, and taper down to a smaller end than J.I.S. spindles do. 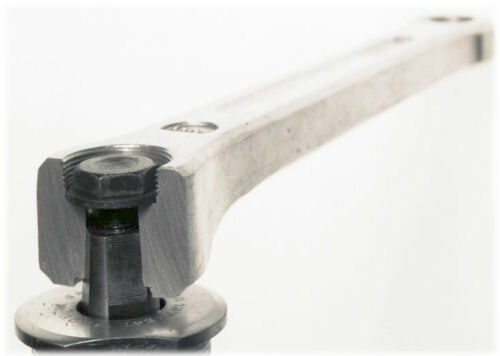 Most European-made square-taper cranks and bottom brackets use the ISO dimensions. Some older Shimano Dura Ace used a shorter taper than most other cranks. Most modern cranks will bottom out on the spindles from these cranks A practical option to keep J.I.S. low profile cranks in service is a Phil Wood bottom bracket with a J.I.S. Low Profile taper. If your intention is to restore a bicycle to its original appearance as a collector's item, then you will have to find an older spindle. The Internet is your friend in this endeavor. places it farther outboard on the spindle. Conversely, if you install a J.I.S. crank on an ISO spindle, it will wind up about 4.5 mm farther in than it would on a J.I.S spindle of the same length. Theoretically, ISO cranks should only be used on ISO spindles, and J.I.S. cranks only on J.I.S. spindles. In practice, you can very often get away with mixing these sizes, as long as you select a spindle length that gives the desired chainline. Taper matching was fairly important back in the day of loose-ball cup-and-cone bottom brackets, because these required regular maintenance/overhauls, and this required removal of the cranks. Every time you remove and re-install a square-taper crank, the hole in the crank is liable to get very slightly larger. This was particularly an issue when using J.I.S. cranks on ISO spindles, because over time, as the crank went on farther and farther, you could run out of taper, and the square end of the spindle would become flush with the surface the crank fixing bolt/washer pushed against. At that point, further tightening of the bolt won't make the crank any tighter, since the bolt is bumping onto the end of the spindle. Tolerances on older spindles may not be closely held, and dimensions may vary enough even with the same model number to affect crank/spindle compatibility. The if end of a bolt-type (hollow, internally-threaded) spindle is too small, it may be ground down, as long as the spindle does not bottom out on the back of the crank and the spindle's internal threads are long enough to hold the bolt. These days, however, most folks are using sealed cartridge bearing bottom brackets. With these, there is no routine maintenance required, so typically the crank will be installed once, and will stay in place unless/until the bottom bracket needs to be replaced. This greatly reduces problems of wear to the interface. I generally avoid mixing sizes on customers' bikes, but I have a lot of experience mixing ISO/J.I.S. in both directions on my own personal bikes, and it has never given me a lick of trouble.